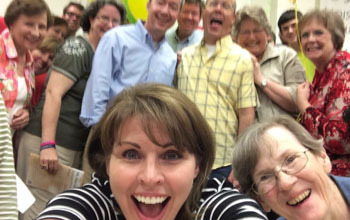 Music plays an important role in the worship of God at Madison UMC. It is our desire to celebrate the diverse musical gifts God has given each of us. We encourage people to develop and use their music gifts in sharing Christ’s message. Our ministry offers opportunity for children, youth and adults in developing and sharing their musical gifts in order to worship and serve at MUMC. Each Sunday the Chancel Choir provides musical leadership in our morning worship services. Our repertoire encompasses a wide variety of styles, including everything from traditional, southern gospel, spirituals and arrangements from todays top Christian artists. We invite you to be a part of this diverse and friendly community of singers, and to share and develop your musical gifts. New members are welcomed throughout the year. Rehearsals are on Wednesdays from 7:10–8:30 pm. Opportunities for soloists and ensemble singers are available to those who participate regularly in choir. Our Student choir welcomes students in grades 7-12. Music selections include popular songs from contemporary Christian artists. The choir periodically leads worship on Sunday mornings and evening student ministry services. Singers are eligible to audition for small ensemble and solo op-portunities as well as the Student Praise Team. Rehearsals are Sunday evenings from 5:30–6:00 pm. Elementary age students in grades 1-5 can learn Biblical truths in this fun and energetic choir! Rehearsals are Wednesday from 5:45-6:10 pm and coincide with the Wednesdays at Madison programming during the school year. The choir divides into two sections for rehearsals: 1st-2nd graders and 3rd–5th graders. Singers join together as one large choir for performances in the fall and spring. Our youngest singers enjoy a time of singing and praise as part of their Wednesday evening chil-dren’s classes which meet from 6:15-7:00pm during the school year. 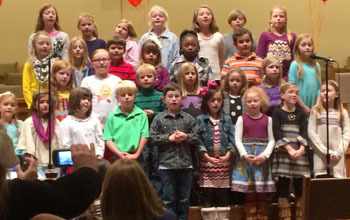 The children participate in the fall and spring children’s choir performance along with the SonShine Choir. Opportunities are available for musicians who wish to serve and worship through instrumental music. Those interested should contact the Director of Music Ministries, Lori Blount at 601-856-6058.